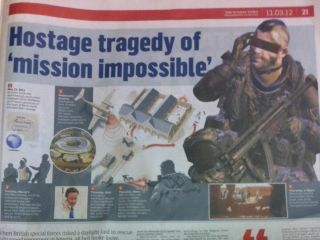 The Sunday Times this week published a story about the tragic failed rescue of two hostages in Nigeria, using a Call of Duty soldier to illustrate the piece. Contrary to what the article would have you believe, CoD's John 'Soap' MacTavish was not involved in the ill-fated rescue mission that lead to the deaths a Briton and an Italian who had been taken hostage in May. The character's eyes have been blocked out for no good reason given than he's a fictional video game persona and therefore not under threat from any enemy troops perusing the Sunday Times over a boiled egg and soldiers. It's not abundantly clear whether or not the Sunday Times knew the image was taken from a game and not real life, but neither option really paints the paper in the best light possible. It's not the first time that something like this has happened; in September 2011 ITV was caught using footage from ARMA 2 in a documentary about Gaddafi and the IRA. Ofcom ruled that ITV's fubar represented a "significant breach of audience trust".